NEWARK, Del. – Hundreds of members of the Delaware Air National Guard 166 Airlift Wing were welcomed back home on Sunday after they were deployed to areas across the globe in support of the war on terrorism. “Over there the mission is actually real, you’re not actually flying around a flag pole or doing some maintenance that doesn’t really matter, you’re actually helping somebody down the stream in the war fighting,” said Matthew Jackson, a member of the Delaware Air National Guard. Jackson from Seaford said he fought side by side with troops in Kuwait where he frequently faced harsh elements. “The long twelve hour shifts, the heat, it was always like 120 degrees out there,” said Jackson. “Sand would just come out out of nowhere and just blast you, and it was sand everywhere,” said Jackson. According to the Seaford man, even though being out in the field was hard it was even harder being away from family, especially during special occasions. Some of these troop members said they have been serving with the Delaware Air National Guard for decades, but it never gets easier. “The kids, my wife, everything,” said Brian Hardy, a service member. “Just being home, being at the house and I miss going out to Fifer Orchards when it’s open and just hanging out, and I do miss going down to the beach,” said Hardy, from Camden. But, despite these challenges troops said they are proud to fight for their country and to share their love for service with the community. “When I look at my kids, they get to see me in uniform,” said Bernie Kale, public affairs director at the Delaware Air National Guard. “They get to see a great event like this and it sort of passes a legacy down to say, ‘Hey, people in uniform they serve even if it’s once a week and a month, they do great work and the community gets to see you,'” said Kale. Kale also said some of these troops flew over places like Iraq and Afghanistan, but they are happy to finally be home. According to the public affairs director, it has been a few years since they last hosted this homecoming for the Delaware Air National Guard’s 166th Wing. Kale said it takes a lot of logistics, leg work and coordination to put this heartwarming event together. 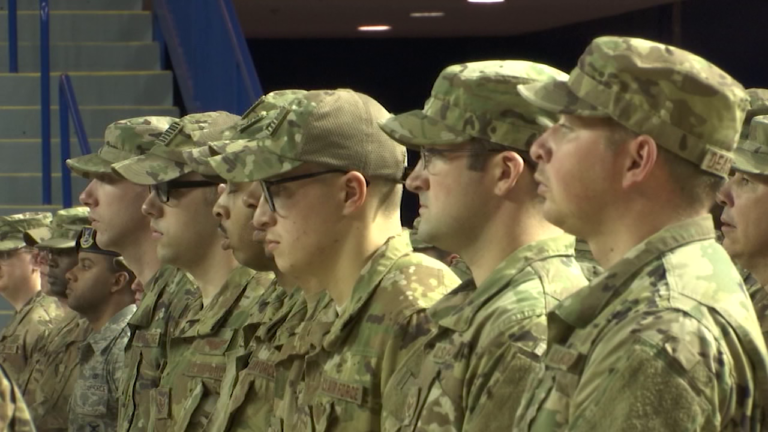 The Delaware National Guard usually hosts smaller events to celebrate troops, but they are hoping to create larger ceremonies in the future where they can honor more service members as well as their families. Sunday’s homecoming was thanks in part to the efforts of dozens of volunteers in the community. Kale said even though it takes a lot of coordinating for this homecoming it is the least the community can do to support troops.